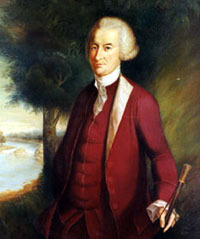 John Dickinson was born in Talbot County, Maryland on November 2, 1732. The family - father Samuel Dickinson, his second wife, Mary Cadwalader of Philadelphia, and assorted step-brothers and sisters - moved to an estate in Delaware a few years after. There the children enjoyed the privileged upbringing and private education of the landed elite. At eighteen, John Dickinson became a law student in the Philadelphia offices of John Moland. In 1753, he traveled to London to study at the Middle Temple. Here he absorbed the particularly English legal attitude of entitlement to protection of ancient rights against new methods of arbitrary rule that had dominated the previous century in British legal and political affairs. This experience and his voracious capacity for study, together with the natural conservatism of his background, marked his overwhelming interest in the relationship between politics and history and foretold his remarkable life of public service that was to come. He extended his stay in London till 1757, and upon returning home, settled in Philadelphia and began a successful law practice. He also entered politics, serving in the Pennsylvania Assembly. He distinguished himself by siding with the Proprietary party against the faction led by Benjamin Franklin that sought to turn Pennsylvania from a Penn family governed commonwealth to a colony immediately under Royal control. The bitter debate of 1764 saw the eloquent and stubborn young Dickinson stand his ground on the simple conservative principle that change might bring more oppressive government and that the chance could not be taken. He lost the debate and his seat in the Assembly. He gained admiration for his principles, however, and he was soon chosen to represent Pennsylvania at the Stamp Act Congress in New York in October, 1765. He had, just before this, published a pamphlet seeking support among English merchants to repeal the Stamp and Sugar Acts as a restraint of trade. At the meeting, he drafted the resolution of the Congress. When this action made no impact on government policy, he began in December, 1768, to publish in the Pennsylvania Chronicle his famous Letters from a Farmer in Pennsylvania to the Inhabitants of the British Colonies, under the pseudonym "A Farmer." Twelve in all, the letters made a masterful argument based upon the contradiction the Acts posed to traditional English liberties and were widely read, admired, and digested on both sides of the Atlantic. Although the writings hinted at an ultimate recourse of resistance, they reflected overall the hesitation to employ extra-constitutional measures, a hesitation that Dickinson would display through much of his later career. The actions of the New England colonies, however, soon moved events beyond the possibility of reconciliation. Dickinson blamed the radicals in Boston for this escalation and the end of any hope of constitutional solution. In the July, 1774 meetings to organize a new congress, Dickinson drafted three resolutions which retained hope that outright rebellion could still be avoided. At the same time, he worked to prepare the defenses of Philadelphia and took command of the first battalion of the city's new militia regiment. At the second Continental Congress, he wrote the Petition to the King, which appealed again for peaceful resolution. When the Crown rejected this approach, the pressures for revolution became unstoppable and brought Dickinson to his famous refusal to vote for or sign the Declaration of Independence. The timing was wrong, he said, to declare war on the greatest power in the world without even a system of government to bind together the various colonies in their constitutionality or even their defense. He did abstain from the final vote, however, so that the Pennsylvania vote would be for independence and therefore the colonies would adopt the Declaration unanimously. He also led the committee to draft the Articles of Confederation. With the war now joined, Dickinson first took up his post as colonel and then resigned his commission over what he saw were a series of affronts that his stand in Congress had brought on. Though the actual case is not clear, many accounts have him serving as a private soldier, notably at the Battle of Brandywine. He also suffered financially; the British burned the family's Philadelphia estate, and Tories or bandits caused extensive damage to his Delaware properties. This caused some economy, including the manumission of his slaves. In 1779, he returned to the Continental Congress and in 1781 was elected president of Delaware. The next year he resigned that post to be elected president of the Supreme Executive Council of Pennsylvania, returning to Philadelphia and the radical turmoil in that state. In 1786, Dickinson joined James Madison in a convention at Annapolis to revise the Articles of Confederation. Dickinson was elected president of the gathering, and a brief session soon adjourned in favor of a larger such meeting to be held in Philadelphia. From May to September, 1787, Dickinson sat with other delegates in what is now known as the Constitutional Convention. His contributions to the debates centered mainly upon the election of and powers for the federal presidency. Under the name "Fabius," he wrote nine succinct essays urging the ratification of the new constitution while warning against the gathering of too much power in the hand of the national government. Following the success of ratification in both Delaware and Pennsylvania before the end of 1787, Dickinson essentially retired from political participation, ironically never holding any office under the new constitution he had so much helped into being. He still wrote, however. In 1798, with the French Revolution losing so many of its initial backers in the United States, he wrote a second series of "Fabius Letters," this time rather uncharacteristically defending friendly relations with France. He felt France was one nation to which the United States owed victory in its War of Independence, the later excesses of the Paris Revolution notwithstanding. He also moved into line with Thomas Jefferson and those who resisted a strong central power for the federal capital. In 1803, he despaired of France, newly imperial and under the sway of Bonaparte, and wrote An Address on the Past, Present, and Eventual Relations of the United States to France in which he dubbed that nation now a threat to United States interests. In July, 1770, Dickinson had married Mary Norris, the daughter of Isaac Norris, then president of the Philadelphia Assembly. Mary Dickinson shared with fortitude the vicissitudes of the following decades. The couple had five children, though only two daughters, Sarah and Maria, survived infancy. The family lived quietly in their townhouse in Wilmington, Delaware. John Dickinson died there on February 14, 1808. President Jefferson expressed his sorrow, and both houses of Congress resolved to wear black armbands in mourning. He was buried in the cemetery of the Friends Meeting House in Wilmington.